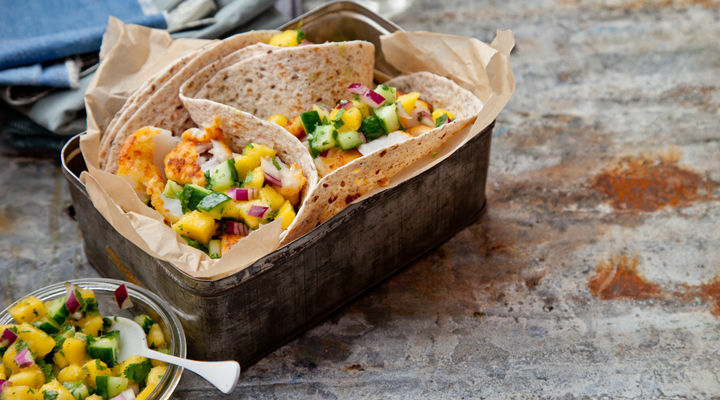 The mango salsa adds a sweetness to these spiced fish tacos. These tacos will be prepared in no time and are the perfect summer meal. Scoop the avocado flesh into a blender with the sour cream, honey, garlic, half of the coriander and half of the lime juice and whizz to combine. Slowly pour in the almond milk as it blends to achieve your desired constistency (you might not need all of it). Taste and adjust the seasoning with a little more lime juice if needed. Set aside. To make a mango salsa, mix together the diced mangos, onion, cucumber and the remaining coriander with some of the remaining lime juice. Season to taste with salt and pepper. Pat the hake portions dry with a piece of kitchen paper and sprinkle with fish seasoning. Shake some plain flour into a bowl and coat the fish thoroughly in it, shaking off the excess. Heat some rapeseed oil in a pan set over a medium heat, then add the hake and fry on each side, ensuring a golden crispy coating. Transfer to a plate lined with kitchen paper to absorb any excess oil, then flake the fish into bite-sized pieces. Just before serving, toss the shredded lettuce in the avocado dressing and season with salt and pepper. Bring all the elements together in a warm tortilla and drizzle with a little hot sauce for extra depth and kick.